Bharathidasan Matric Higher Sec. 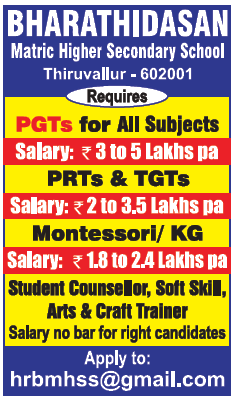 School, Thiruvallur has advertised for recruitment of Teachers PGT / TGT / PRT / KGT jobs vacancies. Interested and eligible job aspirants are requested to apply immediately from 02nd December 2018. Check out further more details below.